It's time to Seize The Birthday, and for this challenge our option is Sunshine. These girls are all ready for a birthday road trip on a sunny day! I stamped the image (Paper Artsy) and coloured it with Distress Inks, then stencilled a sunshine and clouds using the ARTplorations Clouds stencil. I added a sentiment (Hero Arts) and some torn washi tape, then adhered the panel to a black card base. 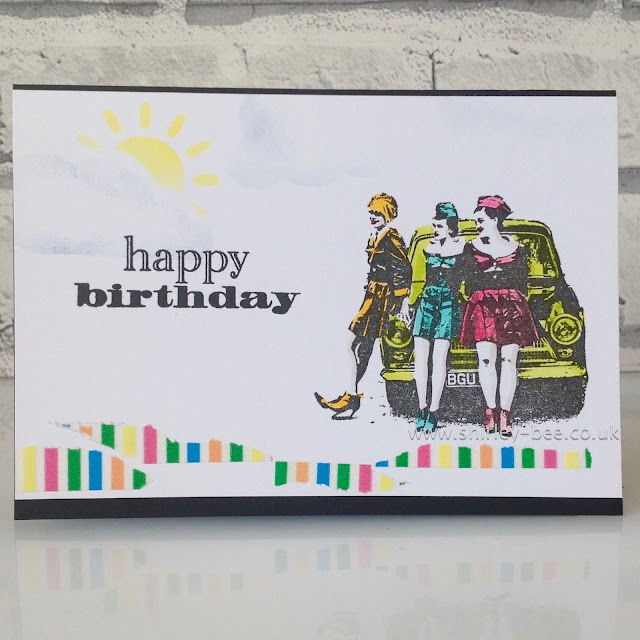 Pop on over to the Seize The Birthday blog for some more fabulous sunshiny inspiration from the rest of the Design Team, and join in with us. If you don't want to use sunshine in your project, that's fine as long as it's a birthday project. This is fun and very vintage! Nicely done! Another fabulous image! I remember seeing b & W pics just like this in my mom's cedar chest! Love the washi border! Sweet card...love your adorable images. Love this card Shirley! I especially like the subtle clouds and the sun peeking through!